Welcome back to the Buffy the Vampire Slayer rewatch! We've made it through two seasons of slayer-fighting fun and exposition. But, now it's time to start (arguably) the best season of the series. You wouldn't know it from Buffy the Vampire Slayer Season 3 Episode 1. "Anne" started more on a somber note before bringing the Scoobies back together. We did have that cliffhanger of Buffy leaving holding us down, after all. Now we can discuss why Buffy needed to be back in Sunnydale. Join us in rewatching "Anne"! Willow was the perfect person to take over the Scoobies in Buffy's absence. She is clearheaded, intelligent and everyone likes her, even Cordelia. Her position seemed like a natural fit. Though, seeing how uncoordinated the Scoobies were without Buffy proved that they really did need the slayer more than she needed them. At the end of the day, three humans couldn't kill one vampire. And that's not even counting their odds of losing half their targets throughout the summer. The group made a lot of bad fumbles fighting Vampire Andy. They're lucky the vampire made a run for it instead of fighting. Coming up with quick-witted sass is harder than you would think. Being wordy takes a special skill; enter Buffy Summers. Willow almost had it, but her sassiest moment had to be when she called out Xander for being excited about Cordelia returning. Her retort was a subtle one, but it's one that left a smile. Xander: I can't wait to see Cordelia. I can't believe I can't wait to see Cordelia. Willow: I wonder what our first homework assignment is gonna be. Willow: Hey, you're excited over Cordelia, okay? We've all got issues. Permalink: I can't wait to see Cordelia. Buffy was still clearly heartbroken over the death of Angel on Buffy the Vampire Slayer Season 2 Episode 22. You could see the sadness on her face while she waited tables at the diner. Ricky and Lily were shoving their PDA in her face. Both of them were in love, but they didn't need to show off their tattoos or boast about their romance in front of a stranger. Yes, they were a young couple in love, but a simple read of the room would say that Buffy wasn't having any of it. Their encounter at the diner was awkward overall. Sunnydale High's scenes had one of the best editing techniques on Buffy the Vampire Slayer Season 3 Episode 1. The continuous cut from the library to the hallway lounge perfectly captured the energy of the first day back in school. The seamless edit showed that the Scoobies's world was only a small part of Sunnydale life. And the extra cut-ins by the background characters, like the teachers and Larry, added much-needed humor to contrast the seriousness of Buffy's story in Los Angeles. Even though Cordelia and Xander were older actors portraying high school students, the moment of them being awkward with each other felt so teenager. Not much happened in their scenes, except being super excited to see each other, but their interaction was adorable and perfectly comedic. Willow and Oz, on the other hand, glossed over a serious issue in their relationship. Oz didn't tell Willow, who was his girlfriend, that he was returning to school. Did he think this would be a fun surprise? Keeping this big life decision a secret only made him seem shady. Why wouldn't he discuss it with the person he loved? 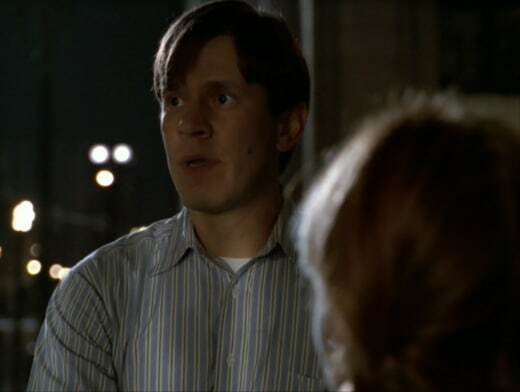 Did you recognize Chantarelle from Buffy the Vampire Slayer Season 2 Episode 7? Seeing the return of the former vampire cult member as Lily was a pleasant blast from the past. She was another small character who's role became much larger later on. If you didn't know, Lily did change her name to Anne and started working at a homeless youth center in the spinoff series, Angel. Lily had a lot of guts to reach out to Buffy. She had no reason to seek Buffy out once she recognized her, but she was concerned about the woman who saved her life. Being a waitress in Los Angeles is a far cry from a Sunnydale High student. In the grand scheme of things, knowing that Lily, who was a minor character, helped Buffy come to terms with her heartbreak did create a lot of appreciation for her. I like the role and development of Chantarelle/Lily/Anne. Let's talk about Buffy's pain threshold for a moment. She got hit by a car and simply walked away like it was nothing? No pain at all? That takes a lot of strength. We've seen her in battles before and she suffered injuries because of them. A lot of that was fist-fighting; however, this time it was a car! Buffy walked away looking for the old man like it was no one's business. There are moments where Buffy's enhanced abilities made sense and were easily explained. This car crash was one of those times that seemed a tad off from reality. Who else loved seeing Joyce and Giles become closer? 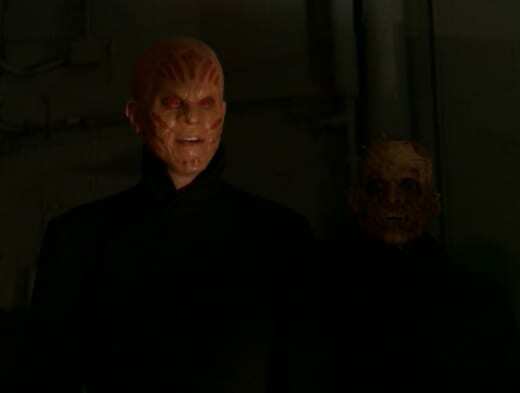 These two were the closest people in Buffy's life and they were kept separate for a long time before Buffy the Vampire Slayer Season 3 Episode 1. They had moments of interaction, but they never discussed her slayer career. Seeing Giles come to give Joyce the update was the start of their closer relationship/friendship. In another world, they could've started dating. No matter how much Buffy tries to run away, people will always come to her for help. She's simply that kind of a person. She's St. Buffy. Lily was extremely worried for Ricky and when someone goes missing on a supernatural TV show like Buffy the Vampire Slayer, chances were the character was dead. Time was of the essence; without Buffy, she never would've found out what happened to him. Checking out Ricky's past location felt so much like a cop drama. First we had a crime mystery and then a soap opera. The doctor at the clinic was a little too soap opera villain. Her reaction gave away that she knew what happened to Ricky; you don't have the face change and the somber music without meaning to tease something. When Buffy found the dead old man and realized it was Ricky, she couldn't ignore that something terrible was happening. A person doesn't go from young adult to senior citizen that quickly; her intuition picked up on that right away. The doctor was the obvious suspect (from our point of view) because of the music and the expression. She knew something happened to Ricky and she was the next person to interrogate. Whenever I rewatch "Anne," a few questions come to mind about the doctor: Did she know that Ken kidnapped people for slave labor? Was it a simple accident? Did she think she was doing good? Her acting didn't lead me one way or the other; I'm on the fence about her true intentions. She didn't look remorseful, so it seemed like the former, but it's unknown at this point. Xander: Go away this is my hiding spot. Cordelia: Where do I hide? Xander: You don't hide. You're bait. Go act baity. Xander: The vampire attacks you. Xander: The vampire kills you. We watch, we rejoice. Permalink: You don't hide. You're bait. Go act baity. And we got a fluffy Xander and Cordelia kiss to tie the night together. These two were back on track in the romance department, for now at least. Lily: I always knew I would come here, sooner or later. I knew I belonged here. Ken: Isn't it? What is hell, but the total absence of hope? The substance, the tactile proof of despair. You're right, Lily. This is where you've been heading all your life, just like Ricky. The hell dimension was where Buffy the Vampire Slayer Season 3 Episode 1 had the meat of the drama. Once Lily and Buffy were transported there, the pair would have to fight their way out to be freed. It was a good development that brought out the best in both of the characters. Lily learned to stand up for herself and Buffy reclaimed her slayer confidence. Everything about the hell dimension was meant to tear them down until they were nothingness. We even saw a guy be killed simply because he acknowledged his name. And Ken would've enjoyed every minute of watching the group give up hope. Though, Buffy didn't seem like the type to quit. Her comeback to the guard was the perfect reaction for standing up for herself. Even as a prisoner in a different dimension, Buffy still reigned supreme. So, in this dimension, within a day people age almost a hundred years? That part made sense, but the inclusion of the other prisoners thwarted that fact. Hear me out: Buffy and Lily were thrown into the pool portal at night, which meant that it was near the end of day. They were joined by at least four-five other people captured, possibly within that day too. Everyone had the same age going into the portal. Related: Get Shudder via Amazon Channels for Spine-Tingling & Provocative Films, TV Series, & Originals! However, when Buffy and group are escaping, we clearly see a factory filled with countless other prisoners. None of them aged or look any considerably older than Buffy. Did other demons bring them there? Were they transported at a different time? If it took a day to age Ricky, none of those other prisoners should've looked young. The reality of that supernatural world seemed off. Lily pushing Ken off the balcony was the highlight of the fight. She stood up for herself and found the strength she needed to give him a little push. He didn't die until Buffy bashed his head in with the club, but it was fun nonetheless. The push was all well and good, but it was also the expressions of everyone else that made the moment. Buffy looked so mystified and the other demons were equally as confused. We need to appreciate Buffy the Vampire Slayer's comedic elements more often. For such a supernatural show, Buffy the Vampire Slayer was also really funny. When Lily became Anne, it was basically Lily becoming Buffy. She met a confident and strong person whom she admired that saved her life. Lily could always look to Anne/Buffy as the person she wanted to be. Luckily for her, her interaction with Buffy changed her life for the better. 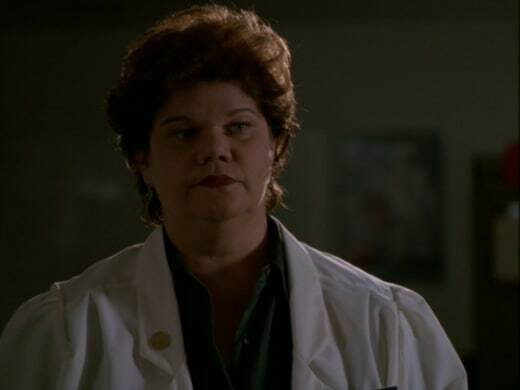 Anne did a lot of good on Angel. She helped at-risk youth in need and worked for the side of good. Buffy changed lives, and she couldn't deny that being the slayer also gives life too. Her duty isn't always about killing things. Who else teared up when Joyce and Buffy reunited? The emotions were strong here! After the pain that was caused on Buffy the Vampire Slayer Season 2 Episode 22, it was nice to see that all was forgiven when Buffy returned. Joyce just wanted her daughter back above anything else. She most likely regretted what she said after Buffy ran away. We'll see Joyce be on-board the slayer train from this point on. However, there will be A LOT of instances where she wasn't happen about the situation and tried to get Buffy to quit. Come on, Joyce! Quitting would've never been a possibility; being a slayer was Buffy's destiny. She was stuck doing the job whether she liked it or not. What did you think of "Anne"? Did you want to see more of Lily? Why didn't Oz tell Willow that he was heading back to Sunnydale High? Want to join us in rewatching Buffy the Vampire Slayer? We will be posting new rewatch posts on Tuesdays and Thursdays. Come back here and let us know what you think of the episode.